COMPLETELY REMODELED Condo at The Renaissance! 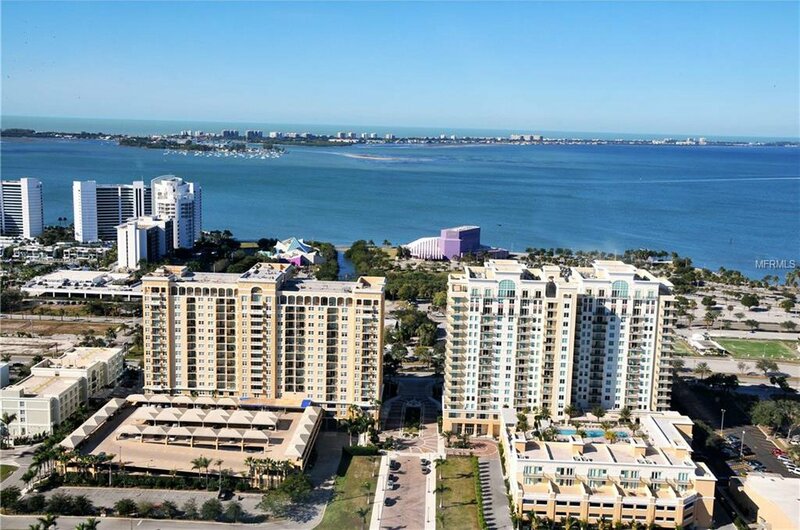 This corner unit is located on the 16th floor with spectacular views of both the Sarasota Bay and the Downtown area. It includes two covered secured parking spaces. The owner spared no detail in the renovation that was completed in 2016, tile floors (no carpet) crown throughout, kitchen and bath remodel, all new cabinets, lots of storage, laundry closet, window treatments. After one year of ownership you can rent the unit for up to 2 times a year and for a minimum of a 3 month Lease. Recreational amenities in this beautiful building include a fitness center; locker rooms and sauna; hot tub at the pool; movie theatre and media room; business center; club and conference rooms; dance or yoga studio; guest suites for visitors at reasonable rates; 24-hour security & concierge service; community outdoor grill area with tables; secure parking. The area has extensive cultural, dining, shopping experiences that are a short walk away, and less than 3 miles to gulf beaches. Arrange your showing today to experience the Renaissance lifestyle for yourself! Listing courtesy of KELLER WILLIAMS REALTY SELECT. Selling Office: FINE PROPERTIES.